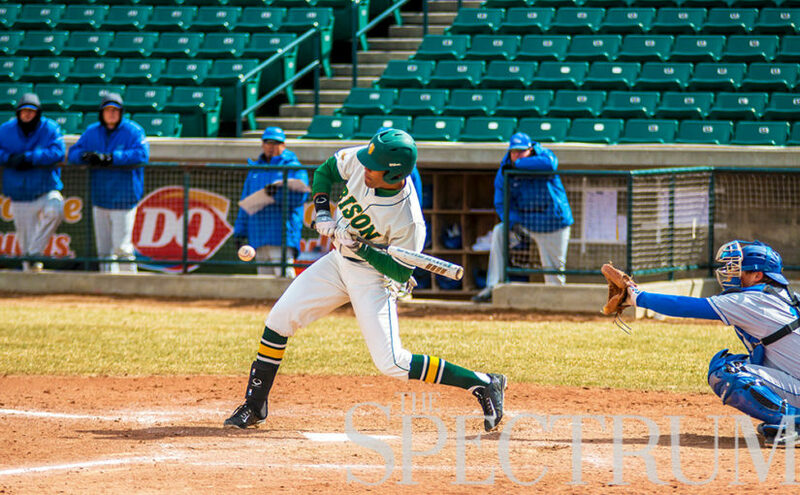 Bison baseball walked off against Oral Roberts on Satruday at Newman Outdoor Field. 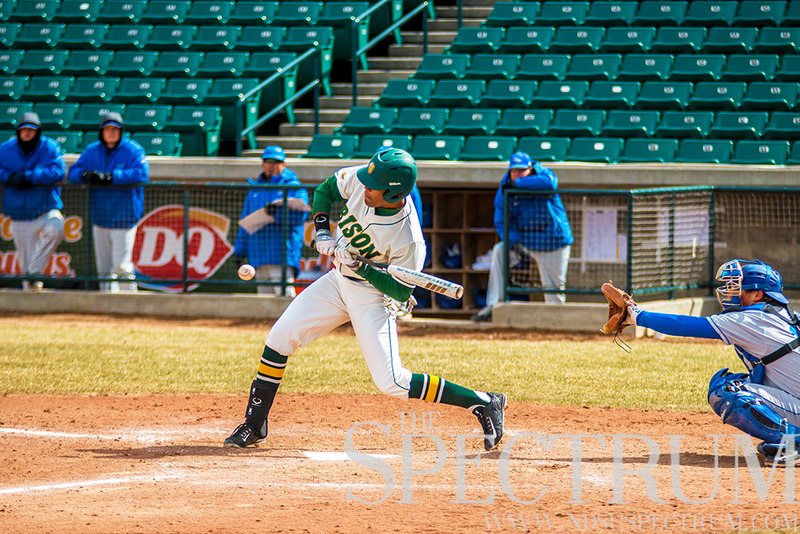 After a rocky middle part of the season, the North Dakota State baseball team has found its stride in the home portion of its schedule. Since the first home game April 6, the team has gone 12-5 with a win over the then-19th ranked Minnesota Golden Gophers. That streak continued with back-to-back wins over conference foe Oral Roberts over the weekend. In the first game of the series, NDSU jumped all over the Golden Eagles early. The Bison scored three runs in the second inning, yet every single one of them was unearned due to throwing and fielding errors by Oral Roberts. Sanders, Regan and Pierzchalski all scored in the hectic inning. The Bison would add one more to the board in the 4th off of an RBI single by Andy Wicklund that scored catcher Juan Gamez. NDSU would need all 4 of those runs as ORU put up a furious comeback. They would score one run in the 6th, 7th and 9th to make it a one-run game until pitcher Brian VanderWoude finally shut the door on the rally to secure the series win. Blake Stockert (2-3) picked up the win, as the Golden Eagles’ Bryce Howe (3-3) would be tagged with the loss. The real excitement came in Saturday’s game two, with both teams trading early one run blows. Ben Peterson would put the Bison on the board first as he knocked a single into left field that scored Drew Fearing from second in the bottom of the 1st. ORU would respond in the top of 3rd when third baseman Chase Stafford cracked a double into right center that scored Trent Shelton. After those early runs, starting pitchers Parker Trewin and Nick Wood settled down for their respective teams. Another run wouldn’t be scored until the bottom of the 7th inning. NDSU was able to plate two runs off of a fielding error and a wild pitch, giving them the 3-1 lead. The Golden Eagles did claw back into it, however, as they got two runs off of reliever Chris Choles in the top of the 8th to make it a tied ballgame. Which set up the biggest at bat of the series. With NDSU shutting the door on their opponents in the top of the 9th, it set up a show down between the bottom of the Bison batting order and possibly one of the best pitchers in the Summit. Brady Womacks stepped onto the mound with a 0.36 ERA in 19 appearances and a 2-1 record, stats not often seen in college baseball. After getting through the first two batters with ease, centerfielder Logan Busch stepped to the plate. He quickly fell behind 0-2 in the count to Womack, but the next pitch would be the last. Busch obliterated the next pitch over the wall in right field to give NDSU the walk off win and series win. With the win, NDSU sneaks into that fourth and final playoff spot in the Summit League with only a couple weeks left in the regular season. They still have three series with Summit League opponents left to play, with two of those series happening at Newman outdoor field.